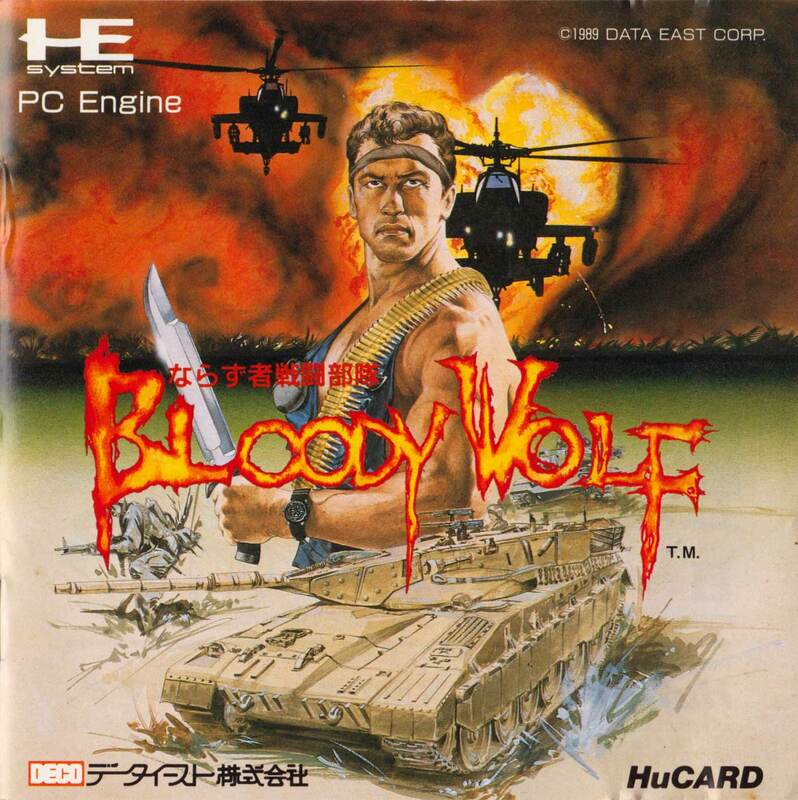 Taking inspiration from games like Ikari Warriors and Commando, with a good dollop of Rambo to top it off, Bloody Wolf gives you guns, death and destruction. What more could you want? Viewed from a sort of overhead/side on angle, you have to make your way through town, river, forest and many other types of terrain with just your wits and a massive weapon under your arm. Along the way you will get the chance to rescue hostages - hiding in trucks, caves, tied to trees etc - and by opening crates you gain useful power ups. These include things like spread shot, flame thrower, rockets and frag grenades, but also contain more subtle items like flippers that allow you to move faster when ducked under water. Also, if you manage to shoot someone off their motorbike, you can get on it and race away, mercilessly running down anyone who gets in your way. At various points in the level you will come across bosses that break up the action a little. Also, you have the ability to jump, which comes in handy when traversing chasms or avoiding any suspicious rolling logs that may be out to get you. To get the negative out of the way first, Bloody Wolf has some bloody horrific slowdown. At certain points, the game almost grinds to a halt. Luckily, this will work more in your favour than against you. But despite this flaw, the game itself is excellent. The levels are long and have enough variation, either in visuals or in level structure to keep you interested. The sound is great with some excellent pieces of music (making great use of stereo). Graphics are well drawn and varied with good use of parallax effects for water, and the game is not too frustrating or too easy either. At first, I thought Bloody Wolf was a decent enough game, but with time it has remained one of my favourites and a great game to really get your teeth into. 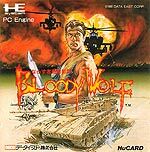 Bloody Wolf is a great little run and gun that always used to be one of the more popular games on the system back in the day, but you don't hear too much about these days. It's an arcade conversion, and a very good one, coming out in the first year of the TurboGrafx. You get to choose between two visually disparate but otherwise identical soldiers, but the 2 player option of the arcade is missing. I like the fact that they don't phone this in, there's a lot of variety in the game that you wouldn't have found at the time. There are helicopters to fight, you get to steal motorbikes, and there are some good set pieces. You even rescue hostages, a-la Rambo (in fact the game is pretty much a pastiche of 80's action films and a bit of Metal Gear). This is the kind of game that's just fun to play, and you can come back to it for some mindless badassery time and again. That said, the continues on the TG-16 version are infinite, which is a bit of a mixed blessing. You'll complete it just by sheer number of attempts, but you won't have the same accomplishment unless you ration out the continues yourself. That's not to say it's easy though, there are definite hard parts that will frustrate you. SOUND TEST: On the title screen push UP + II + SELECT at the same time. FLYING MODE: On the title screen push DOWN, UP, LEFT, LEFT, II, II, I, SELECT. During the game, if you push jump you will now be able to fly around!